What are Children's Worship Bulletins? Our Children's Worship Bulletins include biblically based, theologically sound Sunday school activities about Isaiah and thousands of other topics for kids ages 3-6 and 7-12. Codes, mazes, pictures or other puzzles make learning about Scripture passages from the Old Testament, the Gospels or the Epistles interactive and fun. The quality and usability of Children's Worship Bulletins are unmatched. Included in this brief article are two sample Sunday school activities about Isaiah that you can use with our Children's Worship Bulletins right now. Use one or both for your Sunday school class to engage your kids in the study of the Bible! Divide the class into two teams. Give each team a bulletin, a pencil and a single die. When I say, "GO!" roll the die. When it stops rolling, write the corresponding letter in all the spaces above the picture of the die in the puzzle that matches what you rolled. For example, if you rolled the die and a single dot appears, write the letter "L" in each of the spaces above the pictures of the die in the puzzle with a single dot. Next, roll the die again. Continue filling in the spaces above the pictures of the die that match what you've rolled until you've solved the puzzle. If you roll a 6, then roll again. Give the children time to complete the puzzle. Ask the class "how will God help His people?" They should answer "They will be blessed." Read aloud the story of this lesson from Isaiah 61:1-4 , 8-11 to the class. Give everyone a small prize for completing the puzzle. Sunday school activity about Isaiah for ages 7-12: What happened next? Give everyone a bulletin and pencil. Explain this activity. "The object of this activity is to be the first to solve the "What happened next?" puzzle in the bulletin. Please begin." Allow the children to work until the first person is finished. Check their work. Award the winner a small prize. Read aloud the story of this lesson from Isaiah 61:1-4, 8-11 to the class. We hope you enjoy using these two sample Sunday school activities about Isaiah! And we want you to know that we stand by these and every bulletin with a rock-solid guarantee. If you're ever dissatisfied with Children's Worship Bulletins, for any reason, we'll cheerfully and promptly provide a full refund — no questions asked! 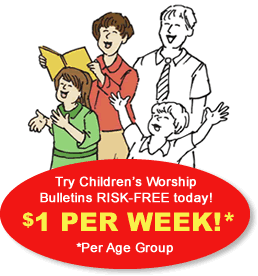 That's just how confident we are that you will love Children's Worship Bulletins.